As previously reported by Kelson, in a effort to fill in the gaps of characters not yet made in the Justice League Unlimited toy line, Mattel is releasing the Justice Guild of America Set on 2/16 for sale exclusively at Mattycollector.com for $30.00. Justice League and Justice League Unlimited devotees will remember the Justice Guild of America from the Season 1 episode “Legends”. The Justice Guild was the closest the show got to featuring the original Justice Society of America, as the creators of the show were not allowed to feature any of the original members due to the nature of the story. To that end they created several analogs that were a direct homage or in some cases a combination of characters. The Streak was obviously based on Jay Garrick, the very first Flash (and the primary reason I’m featuring and purchasing this set). The Green Guardsman and Black Siren were Alan Scott (Green Lantern I/Sentinel) and Dinah Lance (Black Canary I). And Tom Turbine and Catman were amalgamations of the original Atom/Golden Age Superman and Batman/Wildcat respectively. Unfortunately for Batman and Wildcat fans we won’t be getting Catman, but every other member of the group is present and accounted for (well except for mascot, Ray Thompson, himself a tribute to classic comic book writer, Roy Thomas and celebrated author, Ray Bradbury). Again, the set goes on sale at Mattycollector.com for $30.00 on 2/16 so be sure to swing by there and grab yours before they are all gone. And yes there is a limited stock. This entry was posted in Collectibles, Flash News, Timely and tagged Animation, Justice Guild, Streak, Toys on February 13, 2010 by Devin. 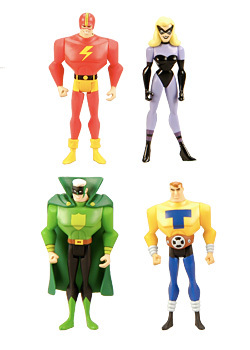 Matty Collector is selling a set of Justice Guild figures, featuring the Justice Society stand-ins Green Guardsman (Green Lantern), The Streak (Flash), Black Siren (Black Canary) and Tom Turbine from the Justice League animated episode, “Legends” (via JSA Round Table). 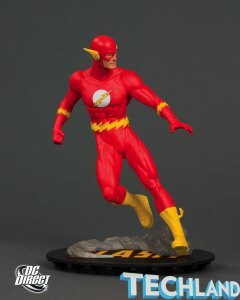 Newsarama has pictures of DC Direct’s JLA Classified Series 3, featuring such classics as Professor Zoom (more or less; the design is sort of a hybrid between Eobard Thawne and Hunter Zolomon), Superman Red (not to be confused with Superman Blue), the Atom, and Hal Jordan (special extra-grumpy edition). Techland has a first look at the DC Chronicles: The Flash statue. This series is “created to capture the original depictions of DC Comics’ most renowned heroes” according to the DC Direct website. So far they’ve announced Golden Age Superman, Golden Age Batman, Golden Age Wonder Woman, and Golden Age Aquaman. Naturally, the next statue is Silver Age Flash. It’s a great statue of Barry Allen, but shouldn’t a line designed around the original versions of DC’s characters feature, well, the original version of the character? 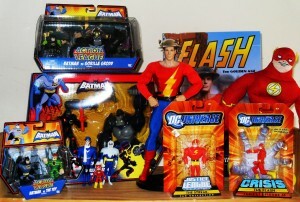 This entry was posted in Collectibles, Flash News and tagged Barry Allen, Jay Garrick, Justice Guild, Streak, Toys, Zoom on February 11, 2010 by Kelson.